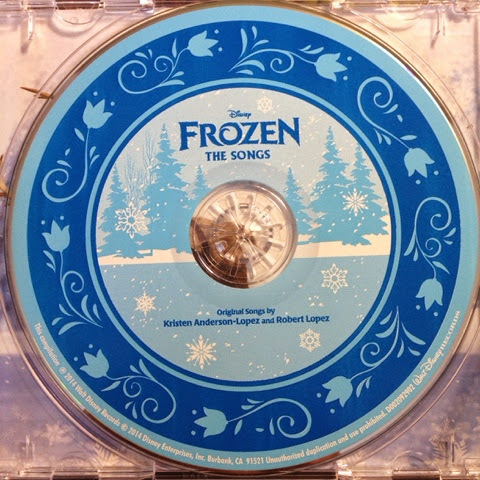 "Disney's Frozen The Songs" Soundtrack Review and Giveaway! 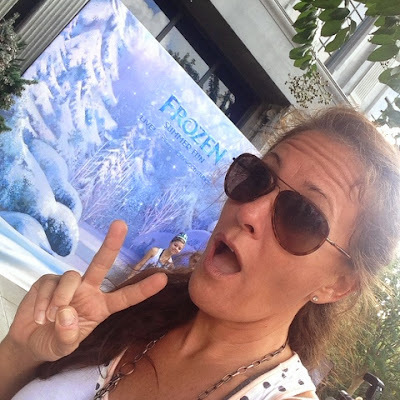 On a recent trip to Walt Disney World Resort, I discovered that the whole "world" has gone Frozen Crazy! If you have not been to Walt Disney World Resort or Disneyland Resort lately, you may have heard the news that the parks have been taken over by all things 'Frozen'. You can't escape it. 'Frozen' is everywhere. 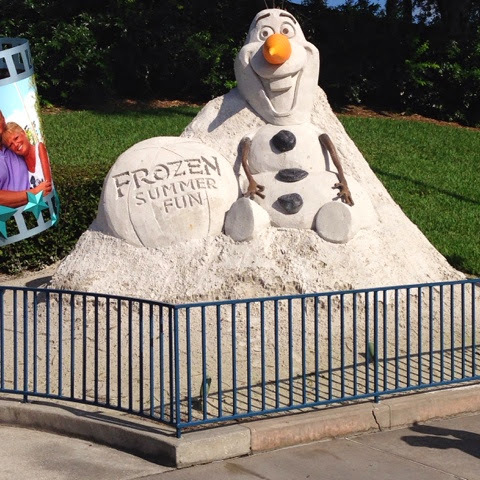 Even Disney's Hollywood Studios declared this summer to be "Frozen Summer". Lots of little Annas and Elsas at every turn....too cute! One of the most popular attractions at Disney's Hollywood Studios this summer was For the First Time in Forever: A "Frozen" Sing-Along Celebration. There you will find an entire theatre full of people singing along with Anna and Elsa. And I mean EVERY WORD, so I was only too happy to find out that I (along with my kids) would be able to preview the new Disney Frozen The Songs Soundtrack before it's official release date of September 30th, 2014! The specially priced Soundtrack includes a sticker sheet , a collectible poster and 10 of your favorite songs from the movie, including The Academy Award winning song of the year from the #1 animated film of all time...."Let It Go". Review---My kids absolutely LOVED the CD. It's been on repeat since we got it and I don't expect that to change anytime soon. That's not much different than the movie....IT'S ALWAYS ON!! My favorite part of the soundtrack?? 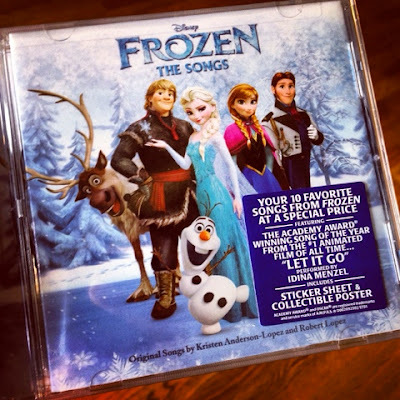 I love the fact that BOTH versions of "Let It Go" are included on this soundtrack. I'm a fan of both versions! Now for the fun part! I have one soundtrack that I will be giving away here on my blog and another that I am giving away on my Facebook page. 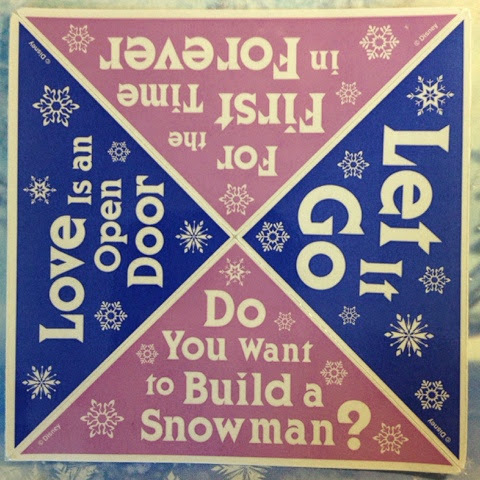 To win your copy of Disney's Frozen The Songs, leave a comment below telling me your favorite song from the movie. It's that simple! 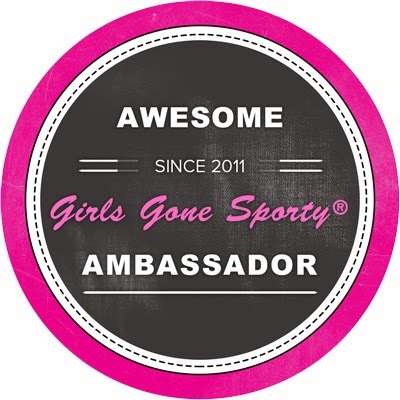 Giveaway ends Saturday, October 4th! 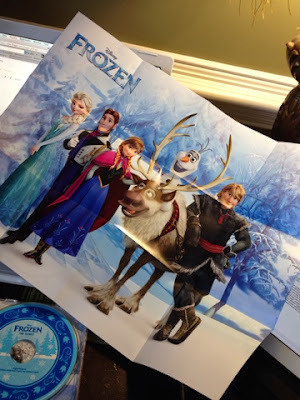 Disclaimer: I was provided with a copy of Disney's Frozen The Songs by Disney Music and ENMN Network to review and giveaway. All opinions are my own. 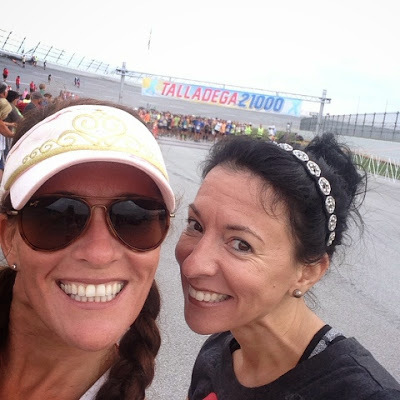 It's no secret that I love running the Talladega Half Marathon in Talladega, Al. I just completed my 5th event (there have been 6). Sponsored by the The Trak Shak, Birmingham Coca Cola Bottling Company, Red Diamond Coffee and Tea, Talladega Super Speedway, Jim N' Nick's BBQ,The Urology Centers of Alabama (Birmingham) and The Birmingham Track Club, the main goal of this race to raise awareness for Prostate Cancer via Urology Health Foundation . Growing up about 15 minutes from this NASCAR track, this is a super fun venue for me. 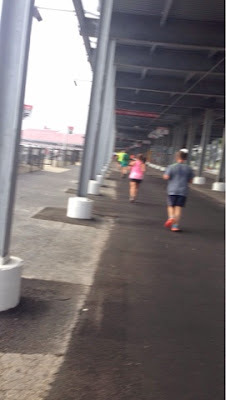 I see lots of friends and family and get to run on the track where I used to "hang out" on as a teenager. 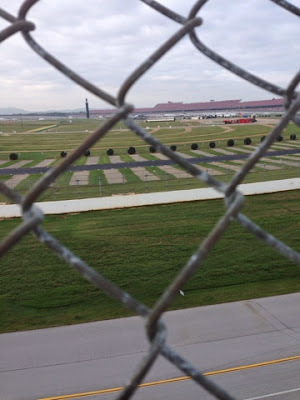 I got to the track before sunrise. 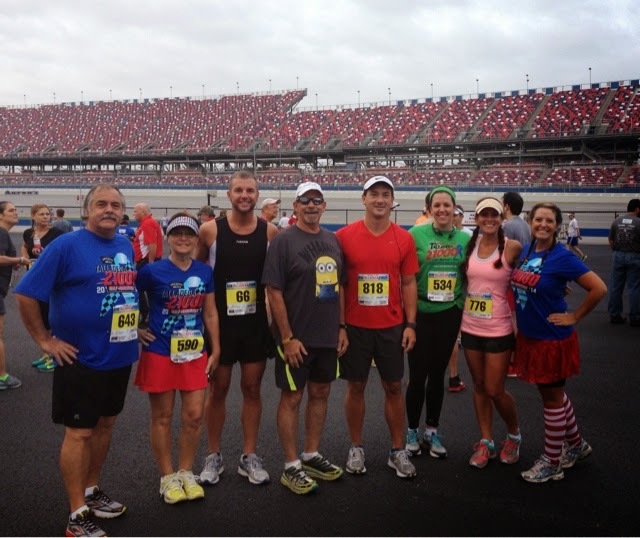 With a 7:30am start time, the race officials ask that everyone arrive no later than 6:30. 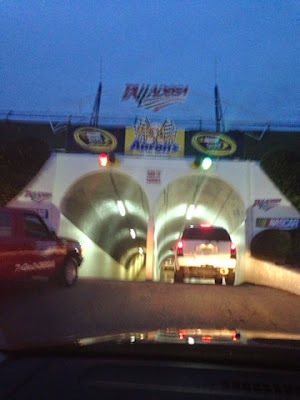 I was pulling in to the infield to park before daylight. How fun is that?! The sun coming up over the track is so pretty! And then, here comes my Dad! He knows not to EVER expect a serious pic! One thing that I really like is that because this race is on a Sunday morning, lots of people will miss church. This race offers a Non-Denominational worship service before the race begins on the infield near the Kids Zone by the pit garage. 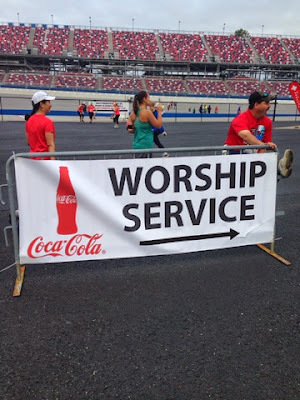 Now that's the way to get your praise and worship on! 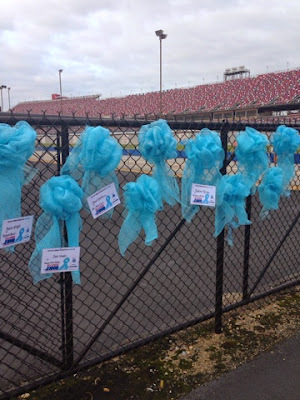 Ribbons line the fence in honor of those battling Prostate Cancer. Very cool tribute to those battling. Selfie time with the sis! Here we go boys! Let's do this! 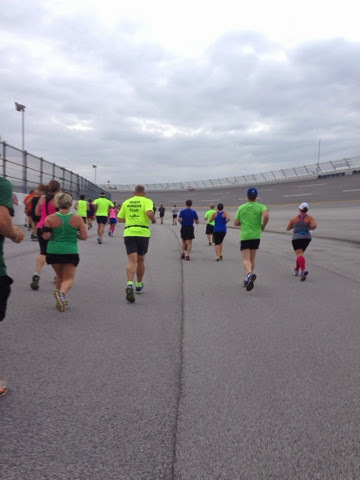 The race announcer announced over the speedway..."This is more than a race!! THIS. IS. 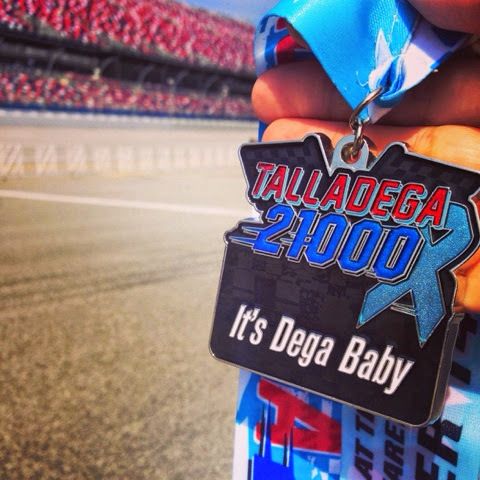 TALLADEGA. The race starts on the track and we are off! Headed for Turn one and the runners already start to spread out. This track is BIG. As we approach the turn, we have to merge closer to the left side. The bank is steep. Not gonna lie, this is killer on the ankles if you are too far to the right. 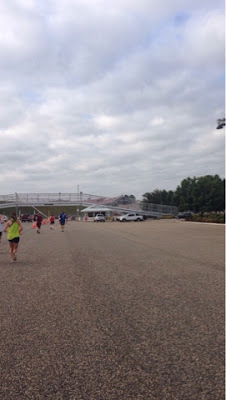 We make a full loop around the track and jump off and head towards the parking lot. As you can see here, we are already up a good but higher than where we started. There are not huge hills, just a gradual incline. In the pic above, I'm looking through the fence over the track. 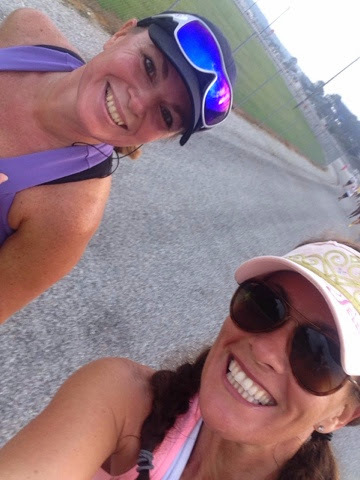 As I was leaving the track, I look over on the bank (just above where the start line was) and I catch our fearless race director (Val McClean) cheering on the runners. I love that about that her. 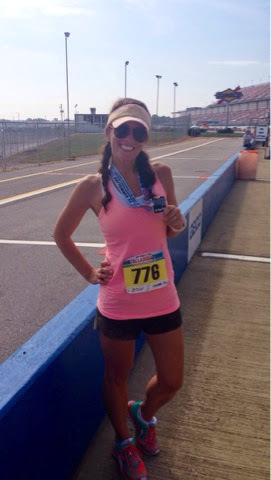 She supports the runners and is on-hand during the entire race. 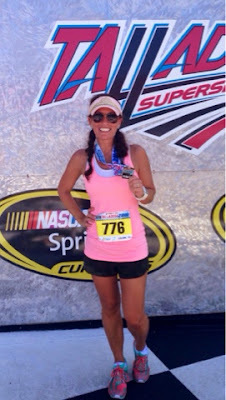 She also coordinates the Mercedes-Benz Marathon Weekend so this lady is the expert of putting on a good race! 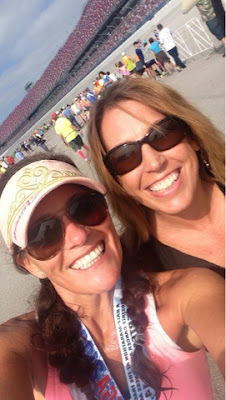 After I left Jodi and her boyfriend, we were headed back into the entrance of the Talladega SuperSpeedway. This was approximately mile 7-8, something like that. 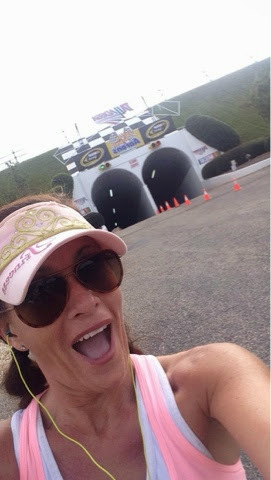 Selfie at the Infield Tunnel Entrance. Up a pretty big hill and then it's time to run the Grandstands! This is a really nice change of scenery. You actually run through the breezeways of the grandstands and there are REAL RESTROOMS there if you need it. I don't stop but I saw lots of other runners taking advantage of them. 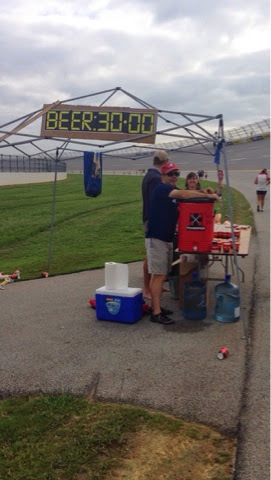 At mile 11.5ish you shall find the Beer:30:00 tent set up. Not kidding. This is an "official" stop on the course. Come on, it's Dega Baby! Another thing that I loved was seeing all of the quotes from the movie Talladega Nights. Any reference to Ricky Bobby or Shake and Bake and I'm in! I loved this quote.....#Merica. One more loop around this track and we are DONE! 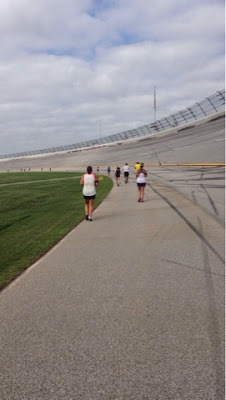 It seems like it goes forever too because one lap around it over 2 miles....WOWZA!! 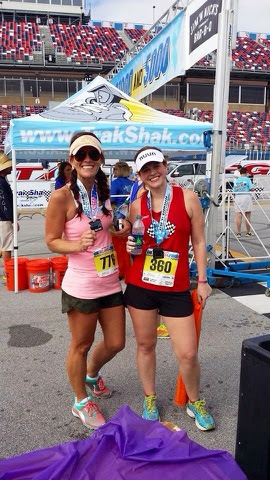 Caution: The Finish Line complete with Checkered flags is straight ahead....I spy the Bling!!!! Rachel and I had really had a blast running together...we sprinted to the finish line like we were total ROCKSTARS for a strong finish and decided that we will definitely run more races together! Too much fun! Can you say hammin' it up for the camera?!! Stopped for a quick pic with Val. She's really a doll and I wish every race had a race director as great as she is! 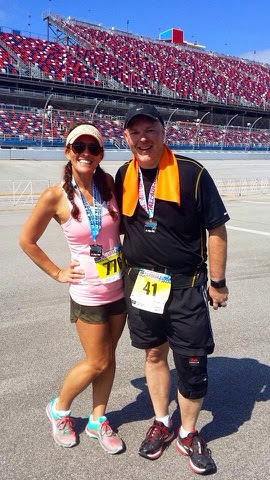 Just as I was leaving the track, I was stopped by another Instagram friend of mine...it's @WDW13point1. 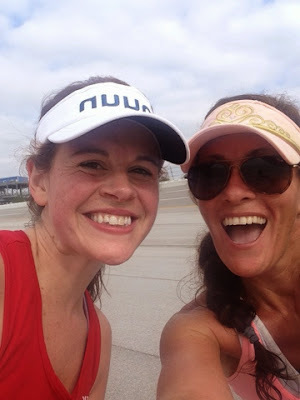 How fun is it to connect with your online buddies in real life?? Super cool in my opinion! Again, I could have chatted with him for hours....So much to talk about! 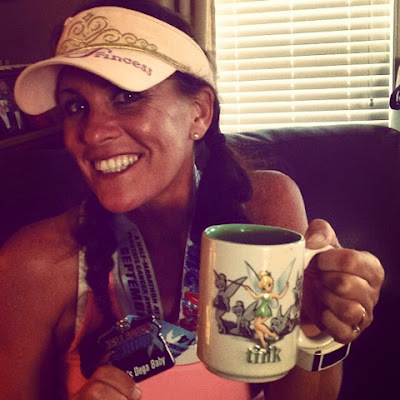 Running, Disney, Social Media. What's not to love?!? So I finally left the track and was headed to the pit garages for the after party....but first, let me take another picture with my medal! The official race photographers were set up on Victory Lane for pics. I had to stop there too. Can you really have too many?!?! And then there's THIS GIRL. I have have no words for the amount of fun that I have with my Leigh Marsh! Get me to the Pit Garage!!! I'm starving!! Next stop. 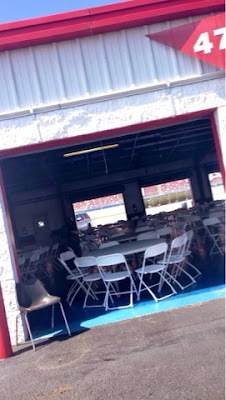 It hit the Pit Garage packed full of Live Music, Lots of Jim N' Nicks BBQ, and of course beer. 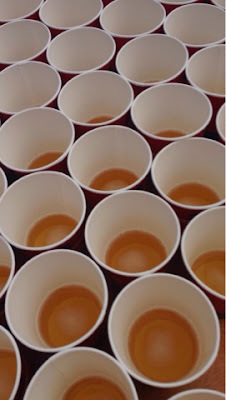 I didn't drink the beer, instead I opted for a hot cup of Red Diamond Coffee. I know, I know. I might just be the only runner in America that wants coffee after a race but I seriously freeze to death after I cool down. Thanks Red Diamond...You are the #BombDotCom! 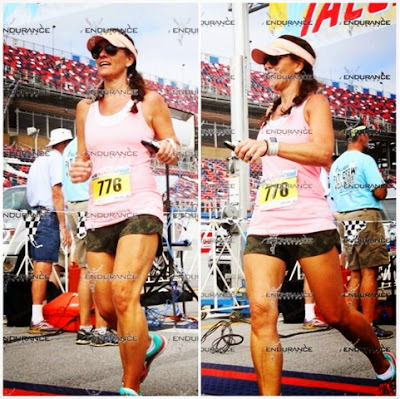 I will DEFINITELY run this race again. It's already on my calendar for next year. 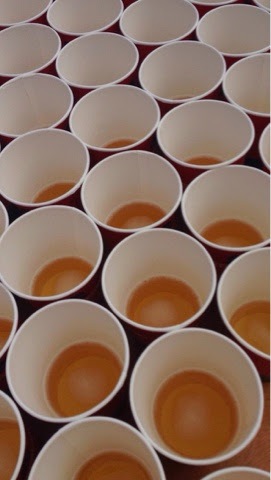 As always, there was not a shortage of porta-potties, water/Power Ade/GU stations. My event shirt was a short sleeve, women's cut dri-fit shirt with the Talladega 21000 Half Marathon logo on it and there was plenty of BBQ! Score! 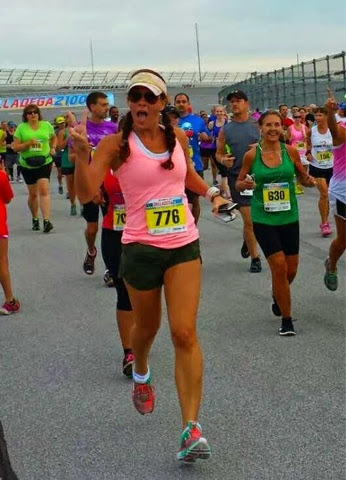 Happy Running and See You at the Track! 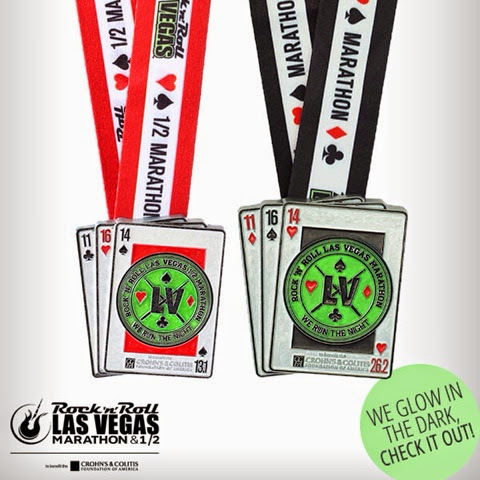 Check out the new GLOW IN THE DARK bling for the 2014 Rock 'n' Roll Las Vegas Marathon and 1/2! 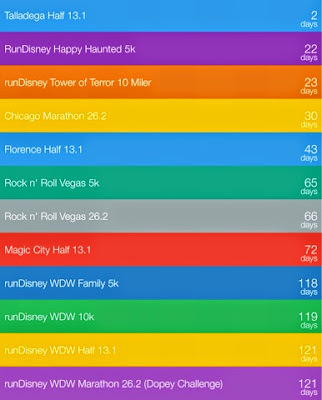 I love the deck of cards theme with the mileage and date of the race in the corner. How cool is that?! And did I mention that they glow in the dark?!?! 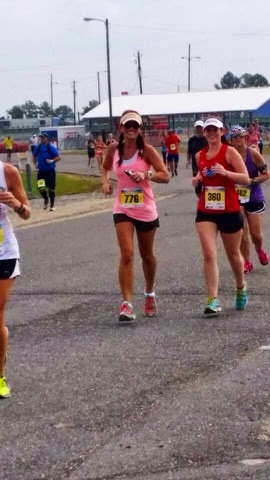 Not only will I be running the Full Marathon but I'm also running the 5k on the Saturday night that weekend. 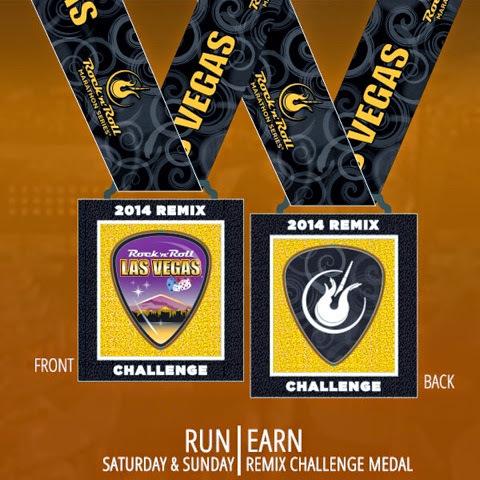 The Remix Challenge Medals were just too cool to pass up! If you haven't registered yet, this race (along with the 5k) are still open....hurry up and register and come run with me! Why Running Marathons FREAK Me Out. 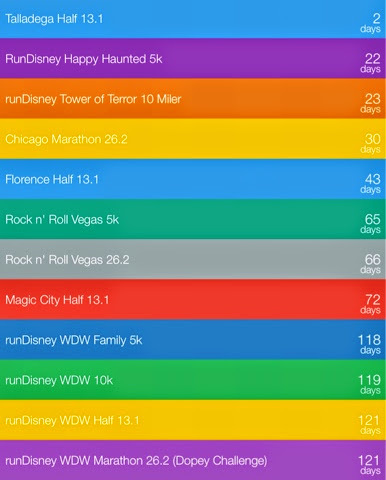 2014-Beginning of 2015 Race Calendar. 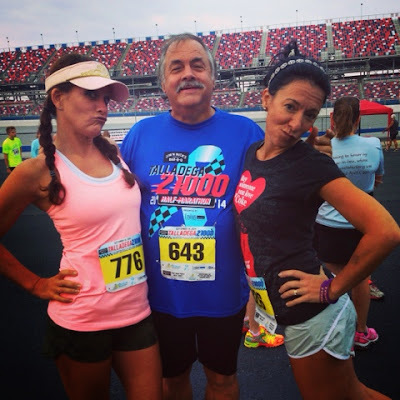 It's always a wacky feeling for me when race day is near....or multiple race days. I had a bit of a freak out the other day when I looked at my calendar. Oh wait. 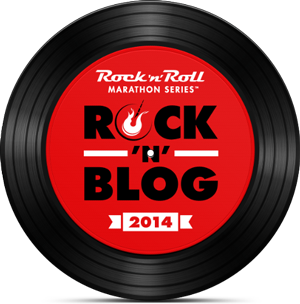 This is my blog...I should be honest and say that I HAD A MAJOR FREAKOUT. 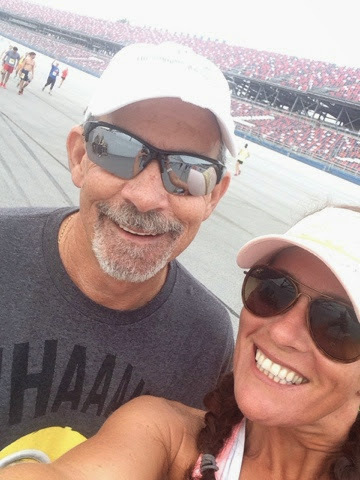 My husband just looked at me as I was already packing clothes for a race that is months away and said "Do you actually hear the words coming out of your mouth? What is your problem? You're an insane person." Hey hubby. Thanks for that! He followed it up by saying..."You'll be fine. You are always are. Hey baby, you're looking good today. Now, what's for dinner?" I guess there's a tiny little bit of him that cares about my running. Maybe. Ha! That's where the Mom in me has to take a step back, re-evaluate and just soak it ALL in for what it's worth. Again, it's just so hard to do!!! I would like to call it "balancing" but I won't even go there. 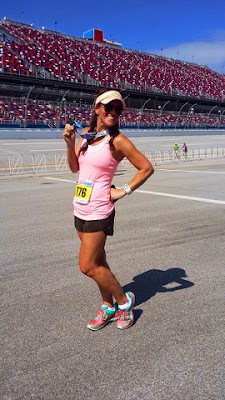 There's no balance in being a marathon runner and living a normal life. This, I am convinced of. 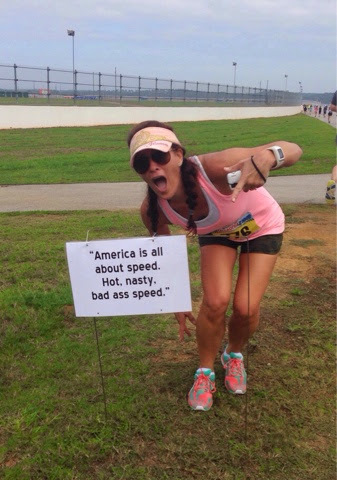 Runners are a strange/good/strange breed of folk. And I'm 100% okay with it. 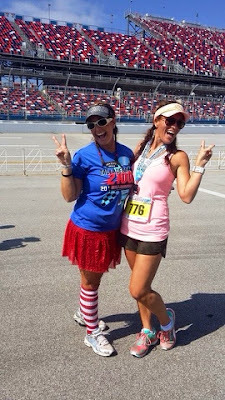 I'm proud to be one of "those runners". I'm freaking out. 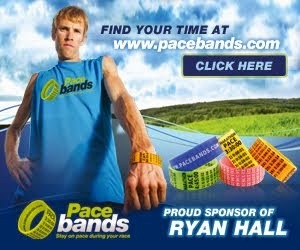 Not just because I'm running alot of races soon. I've got to get the calendar straight for six people. So much laundry to do. 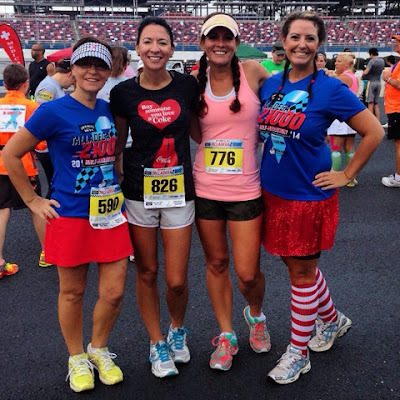 So many miles to run. Tie up the loose ends. 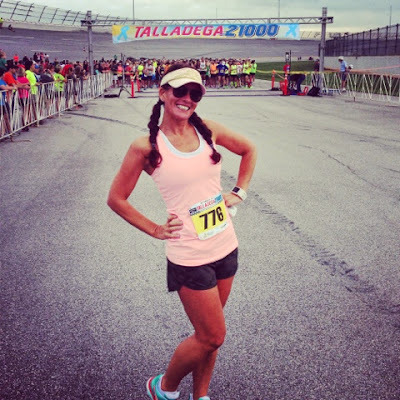 I need cute new running clothes. I need new socks. Time to stock up on the sports-strength deodorant. Oh. My. Gosh. I'm so sick of wearing the same sports bra!!! My kids have late night ballgames. I can't get to bed early if I tried. I NEED sleep. Did I say I need cute new running clothes?? #OperationFreakOut in full session. REALLY. It's not the mileage, its all of the other "stuff" that goes along with being a runner. The running part is the icing on the cake. It's the relaxing bonus for me. It's the You've-been-acting-like-a-nutjob-for-six-months-now-go-get-that-medal-that-you've-had-your-eye-on. Yep. Those are the reasons for my freakout. 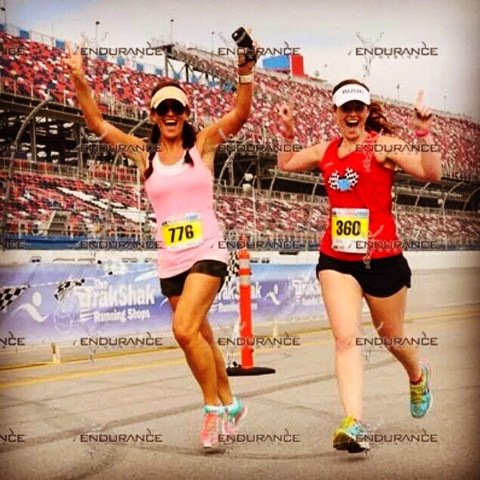 In saying all of this, I'm really excited to run the Talladega Half Marathon this weekend at the Talladega SuperSpeedway and see my running peeps. One of my guy friends called me last night and said "hey girl. whatcha gonna run Dega in?" I said "time? or cute skirt?" He fell out laughing and said..."Well this ought to be fun, I can see you're already on it". 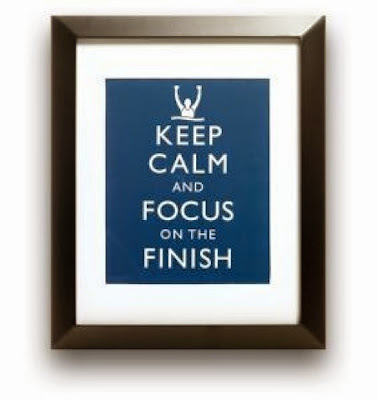 Another week of marathon training is IN THE BOOKS. 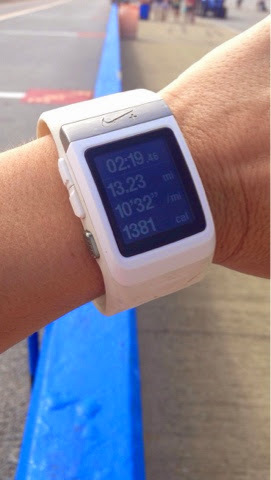 This is the time where I'm either ready to run the race or run a half as part of my training. Lucky for me, that's exactly what I'm doing next weekend. On Sunday, I'll be running my 5th Talladega Half Marathon. 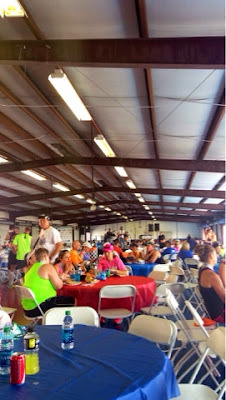 I love this race and the weather is supposed to be in the low 60's at the start. Heaven on a NASCAR track. YESSSSSSS. See my full marathon training plan here.